FTSE Indexes were lower Thursday after tailwinds from Wednesday’s losses and an announcement on rates by the Bank of England caused stocks to fall. The FTSE 100 traded lower closing at 6,104.19 for a loss of -58.30 points or -0.95 percent. The FTSE 250 was also lower for the day, closing at 16,659.87 for a loss of -60.88 points or -0.36 percent. 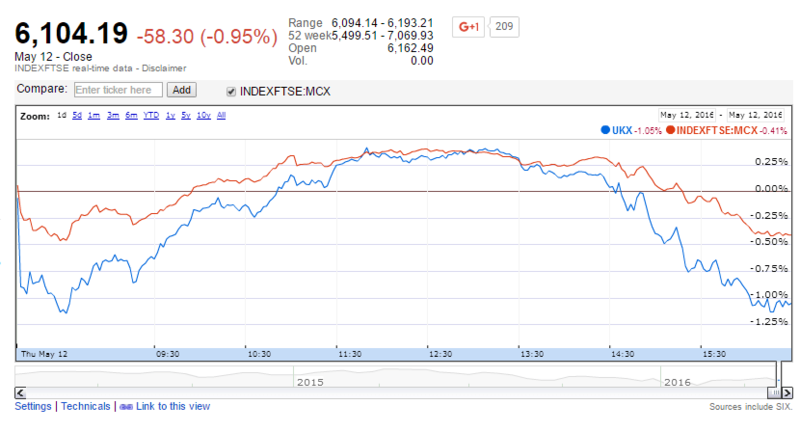 Source: FTSE 100 and FTSE 250. Google Finance. U.S. market affects Wednesday led global stocks lower and Europe was one region highly affected. In the U.S. Wednesday Disney, Macy’s and Staples led stocks lower as the retail companies reported lower earnings and a weaker outlook. After the recent reports from the retail sector it is likely that retail sales will fall below consensus in Friday’s U.S. retail sales report. For the day Wednesday, the Dow Jones Industrial Average lost -216.82 points or -1.21 points to close at 17,711.53. The S&P 500 was also down, closing at 2,064.48 for a loss of -19.91 points or -0.96 percent. The Nasdaq Composite closed lower at 4,760.69 for a loss of -49.19 points or -1.02 percent. Combining with the day’s losses, U.K. traders were focused on the Bank of England’s rate decision. The Bank of England kept interest rates unchanged at 0.5 percent which pushed stocks lower. The Bank of England also reported a softer outlook for economic growth. Uncertainty over the U.K.’s exit was also a factor. Bank stocks were lower following the news with stocks leading losses including Credit Agricole and Deutsche Boerse. Data from IFA magazine reported the following stocks leading losses in the U.K. on Thursday. In other European markets, Germany’s DAX closed at 9,862.12 for a loss of -113.20 points or -1.13 percent. France’s CAC 40 was lower at 4,293.27 for a loss of -23.40 points or -0.54 percent. The Stoxx Europe 600 closed at 333.11 for a loss of -1.63 points or -0.49 percent. The Europe Dow closed at 1,534.23 for a loss of -11.63 points or -0.75 percent. In Asia, market trading was mixed. In China, the Shanghai Composite was down -1.18 points or -0.04 percent to 2,835.86. Hong Kong’s Hang Seng Index was down -139.83 points or -0.70 percent to 19,915.46. Japan’s Nikkei was up 67.33 points or 0.41 percent to 16,646.34. The S&P BSE Sensex gained 193.20 points or 0.75 percent to close at 25,790.22 and India’s NSE Nifty gained 51.55 points or 0.66 percent to close at 7,900.40. As a broad market measure, the Asia Dow was down -6.32 points or -0.24 percent to 2,633.64.